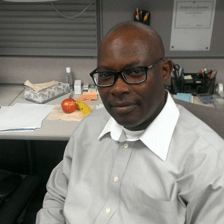 Collins Ugochukwu, Ph.D., is an experienced project manager and a strategic analytical professional. His environmental career began in Nigeria. With his extensive education and professional experience, Collins has made a successful transition to Canada’s environmental industry. Collins is currently working in the Oil Sands Policy Division at the Government of Alberta’s Department of Energy. He co-leads the development of the Provincial Oil Sands Strategy and provides comprehensive policy recommendations and advice for responsible Oil Sands development in Alberta. Collins has an impressive educational background. He has a Bachelor’s in Biochemistry, a Master’s in Toxicology, and a Master’s in Environmental Engineering in his home country of Nigeria. He also holds a Ph.D. in Environmental Resources Management from Brandenburg Technical University Cottbus in Germany. Collins describes his career path as smooth. He started his career as an Environmental Coordinator at a Nigerian Engineering/Consulting Company. He was later promoted to the position of Environmental Project Manager, where he managed a number of Environmental Impact Assessment (EIA), Site Assessment and Site Remediation projects for the Oil and Gas industry in Nigeria. Collins also worked as an Assistant Professor at the Federal University of Technology Owerri, Nigeria where he taught a number of undergraduate courses in Biotechnology, Biochemistry and Environmental Science. While studying for his Ph.D. in Germany, he also undertook a number of research studies related to environmental toxicity, life-cycle assessments and eutrophication effects on biodiversity. In 2007, Collins immigrated to Canada and became a permanent resident. With family in Ontario, he began his Canadian environmental career with the Ontario Public Service – Ministry of the Environment in Toronto. He started as a Program Support Coordinator with the Environmental Assessment and Approvals Branch and then worked as a Projects & Planning Advisor for the Source Protection Programs Branch. With more work opportunities in his field in Alberta, Collins then moved to Edmonton and worked as an Environmental Project Manager for Parsons Corporation where he planned and managed a number of Environmental Site Assessment projects. In January 2014, he later joined the Government of Alberta as a Senior Environmental Analyst and then moved into his current role as a Senior Strategic Analyst with the Oil Sands Policy Division. When transitioning to Canada’s environmental industry, Collins researched professional organizations and networks he could join. He came across ECO Canada and the Environmental Professional (EP) certification. EP was a tool he could use to have his education and experience validated in Canada, a challenge he was looking to overcome. He became a certified Environmental Professional in-training (EPt) in June 2008 and upgraded to full EP certification in March 2014. Collins holds specializations in Water Quality, Energy, Natural Resource Management, Policy and Legislation, and Sustainability. For those looking to start their careers in Canada’s environmental industry, Collins’ advice is to attain Canadian professional designations like the EPt for a start and make the most of networking. Networking in person is vital, he says. “Belonging to a professional organization helps you meet the right people including professionals and employers.” He also suggests that mentoring helps connect new professionals with the experienced ones, and such interaction could create job opportunities as well. Collins Ugochukwu is both a certified EP and a Professional Biologist. “Canada is all about certifications. As an established professional, your experience needs to be recognized, you have to demonstrate your competency, and then meet the job requirements,” Collins says.